Got big fitness goals? Looking to lose weight or catapult past that fitness plateau? It boils down to the right exercise equipment for small spaces so you can build that home gym, stay consistent, and crank those exercise intervals to max volume. Whether you’re a weekend warrior needing to shed that extra 15 or 50, or you’re an elite athlete staying on top of your game, you know that every second counts. You need to fit in a workout wherever you can in your busy schedule–5 minutes here, 10 there. That’s why I’m so revved about the data on HIIT and weight training. In their review article, “The Physiology of Fat Loss,” professors of Exercise Science at the University of New Mexico (UNM) lay it on the line: high-intensity interval training (HIIT) and weight lifting are the best ways to lose fat, change your body comp to muscle, and turn yourself into that lean, mean fitness machine. Can you see it–that image of you achieving your goals? Then hear it, smell it, taste it: it’s closer than you know! HIIT and weights are the ways; your home gym is the means. You can’t live at the gym, but if you set up your home gym, you can train throughout the day and week. You don’t need a ton of equipment, you need to up those intervals. As soon as you start your exercise routine, blood flow increases to your fat stores and your muscle cells. The blood carries the fat to the muscles, and the muscles burn it for fuel. This process of burning fat for fuel is called oxidation of fat. The highest degrees of fat oxidation occur at low-intensity levels. Is that counterintuitive? It struck me that way, but the profs go on to explain, and it all comes into focus. At high-intensity levels, the muscle cells start burning carbs for fuel in addition to fat, reducing the amount of fat oxidation to levels of moderate-intensity exercise. Now, when you finish exercising, you burn more calories than you did during exercise. This is due to muscle-tissue recovery and storage of carbs for future energy needs. These at-rest activities translate into heightened metabolic rates, and they’re referred to as excess post-exercise oxygen consumption (EPOC). Not only that, the eccentric (muscle extension) phase requires additional cell repair and protein synthesis in the muscles. So when you extend the weights, you’re setting your body up for more at-rest bouts of fat burning. Pretty groovy. Here’s where we are so far: lower-intensity exercises require more oxidation of fat by muscle cells, but higher intensities necessitate greater tissue recovery and carb storage after the workout’s complete (EPOC). When you have access to gym equipment at home, you get way more access to EPOC than when you rely on a commercial gym alone. And the best part is, you can go with a few good machines (1-3), and maximize those intervals. Just reading that study makes me wanna workout. Still have that vision in your mind? You just got closer to making it a reality. Let’s get closer still and talk about some of the best exercise equipment for small spaces. The beauty of Bowflex is they’re an industry leader for good reason. They give you options, great prices, and small dimensions. Whether you’re beginning or pressing it to the max, Bowflex can meet your needs easily. The Bowflex PR1000 Home Gym is my top recommendation for beginners. It’s the least expensive, smallest in dimension, and the bench folds up to store easily. It offers 65 exercises: 16 arm, 8 chest, 5 abs, 9 back, 14 shoulder, 13 legs. You can row with this machine, and weight resistance ranges from 5 to 210 lbs. These features are great for starting your routine, especially at the sweet price of $423.13. The Bowflex Blaze is my top pick for athletes. It can max out with the 310 or 410 lb kit. It’s equipped for over 60 exercises, with a pull-down bar and a leg extension–get those eccentric workouts in and burn, baby, burn! You can row with this machine as well. Like the PR1000, it’s great for fitting into small spaces. The Blaze is 90″X38″X83″–only 2″ higher and 6″ longer than the PR1000. Take a closer look at my Bow flex home gym reviews. I cover these plus three additional machines in greater detail, including available warranties. I also break down 10 benefits of resistance training and provide links to customer reviews, weight benches, power racks, dumb bells, and my blog. Also, click here for my GPS running watch reviews. When the weather’s nice, running is a great way to get a HIIT. 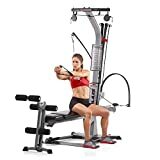 Bowflex extended their spring sale. Check it out here. Set up your home gym ASAP so you can get moving and maximize your fat-burning potential. Once you’re done, you’ll love the following routines. The first on their list is sprint interval training (SIT). Because SIT blasts the intensity to the roof, it requires short, maxed out intervals alternated with long rest intervals: 30 seconds at your most; 4.5 minutes at rest. Exercise equipment for small spaces that facilitate SIT workouts can be easily added to your home gym. In fact, if you go with one of the Bowflex machines I’ve mentioned, you’ll already have one: the rowing machine. The stationary bike, elliptical machine, and treadmill are also great options. The weight-lifting workout suggested in “The Physiology of Fat Loss” hits the whole body in 10 exercises at 8 to 12 reps in up to 6 whole circuits. Rest intervals should be no more than 2 minutes, according to the UNM profs. Also, check out their details on Tabata-inspired interval training and moderate intensity steady-state exercise (MIR). So the upshot is you need more intervals than machines–no problem! As you can see, finding exercise equipment for small spaces is easy, inexpensive, and offers unparalleled results. I hope you’ve found this article helpful. What’s your story? Where are you in regard to your fitness goals and your workout set-up? What is it that motivates and inspires you? Or are you on the hunt for tips on how to stay focused, stay hungry? I can help with that, too. Please leave a comment, contact me, and check out all the great advice and resources my site, fitnessrocks.org, has to offer. When you’re there, don’t forget to sign up for a free PDF on a simple miniseries to reveal your abs. Thanks!